Defibtech Lifeline AED stormed onto the market a couple years ago, receiving acclaim for its innovative design that encompassed simplicity and ease-of-use, an LED screen for convenient voice and text prompting, and all at a low entry-level price point. 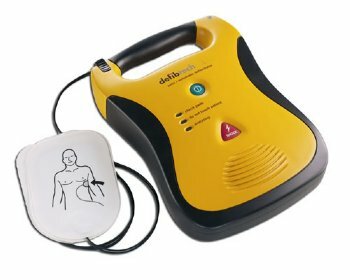 If you're looking for a great and affordable defibrillator that can be used in nearly any environment and by nearly anyone, both everyday folk and experienced rescuers, the Defibtech Lifeline AED is one you'll likely want to consider. The design of the Defibtech Lifeline AED is often the first characteristic people familiar with defibrillators notice – it's unlike any other AED available. The Defibtech Lifeline is a sleek and curvy defibrillator, featuring an eye-catching yellow body with a rugged black casing that enables the Lifeline to handle most rescue situations and environments. Even down to the inclusion of a convenient handle, it seems as though every element of use and design in the manufacturing of the Defibtech Lifeline was considered and included. The aesthetics of the Lifeline may not mean much to some, but for a business owner, school administrator or some other professional that understands the need of having AEDs on hand and readily available, they also understand defibrillators can often be viewed as imposing. (Imagine running on the treadmill at your gym with the boxy Medtronic Physio-Control LIFEPAK 500 hanging on a wall before you.) The Defibtech Lifeline addresses this concern, enabling one to display the life-saving device without jeopardizing the environment and its aesthetics. Not only does Defibtech's Lifeline AED provide a list of user-friendly features at an excellent price point, Defibtech also made sure to include only the finest and latest in technology. The Lifeline AED features a multitude of offerings, including biphasic therapy (preferred by experienced rescue personnel), compliance with the latest CPR guidelines, that ability and option to be used in conjunction with "hands-only" CPR method, recording of patient data and more. Receiving an IP rating of 54 and meeting the United States Military's "Drop and Shock" specifications, the Defibtech Lifeline AED can also take beating and perform in some of the toughest of conditions. 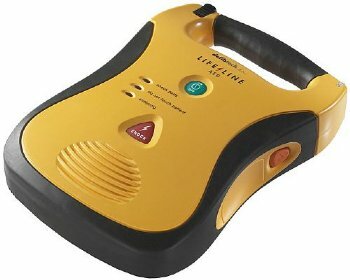 All in all, the Defibtech Lifeline AED is a fantastic device that we strongly recommend. Lay rescuers and those keeping a close watch on their pocketbook will be incredibly pleased. The Defibtech Lifeline is one of the easiest defibrillators to use on the market today and at one of the lowest prices available. Experienced rescue personnel will also be in good hands with the Defibech Lifeline defibrillator, knowing the biphasic therapy technology, high IP rating and more are all included within the bright yellow packaging. The Lifeline's demonstrated success, low price point, simplicity and more make an excellent defibrillator worth anyone's consideration.